Mercy Otis Warren was a poet, playwright, chronicler and one of the American Revolution’s few prominent female voices. Born Mercy Otis in Cape Cod, Massachusetts, she was the younger sister of James Otis, later famous for inventing the slogan “Taxation without representation is tyranny”. Otis herself received no formal education but was instead prepared for the domestic life of a genteel woman. Yet Otis lived in a family where education, literature, law and politics were paramount. She sat in on her brothers’ lessons and developed a passion for education, particularly for writing. 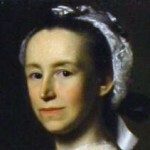 In 1754 Mercy Otis married her second cousin, James Warren. He later served as president of the Massachusetts legislature and paymaster of the Continental Army. In the 1770s Mercy Otis Warren was an active contributor to Massachusetts’ Committees of Correspondence. She penned several essays and pamphlets supporting the revolution, though all were published anonymously. Warren also exchanged letters with several prominent revolutionary leaders, including George Washington, Thomas Jefferson and John Adams. After the Revolutionary War, Warren began to publish plays, satires and political essays in her own name. In 1801 she began collating and rewriting her earlier notes into a comprehensive historical account of the revolution. Warren’s History of the Rise, Progress and Termination of the American Revolution was published in three volumes in 1805. Historiographically, Warren was a precursor to later Whig historians. She considered the American Revolution a great act of political and philosophical progress, a true manifestation of Enlightenment ideals. Warren praised the radicals who had brought on the revolution: men like Samuel Adams, Patrick Henry and Jefferson. She was more critical of those she believed had halted it, particularly Alexander Hamilton and John Adams. Warren was a liberal who placed the protection and advancement of individual rights above all else. She was critical of slavery, arguing that it had no place in the newly free United States. She also opposed the Constitution, at least initially, believing it failed to protect and guarantee civil rights. The passing of the Bill of Rights eased Warren’s concerns and she became a cautious supporter of the new republic, until her death in 1814. With the exception of material under Quotations, content on this page is © Alpha History 2015.